I’m apparently on a strawberry and pecan meal kick, as the last bunch of posts seem to have some version of one of those in them. So now, I shall combine the two. For years, my dad added pecan meal to his chocolate chip cookies instead of chopped up nuts. When I made my own for the first time, I ignored the “chopped nuts” part of the recipe and they never tasted like his cookies. Every time I’ve made them since, it’s been the same result and I could never figure out why. Until now. [The mini-egg chocolate cookies also calls for pecan meal.] Now I’m hooked. This recipe is based on the Toll House chocolate chip cookie dough recipe. Coarsely chop strawberries and stir into mixture. Drop by teaspoonfulls onto baking sheet and bake for 9-11 minutes at 375 degrees F.
Melt chocolate chips via your favorite chocolate-chip-melting method as the cookies cool. 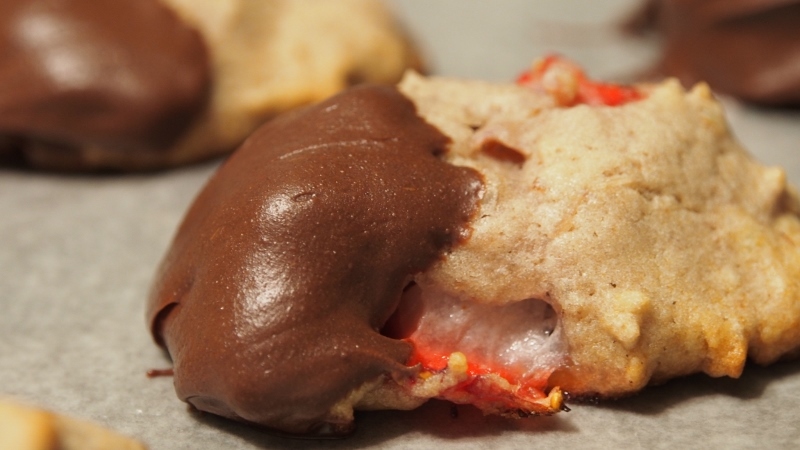 Once mostly cool, decorate the cookies with chocolate! I dipped half of each cookie and let them dry on wax paper before packing them up. This recipe makes about 30 cookies, more if you make them smaller. I was going to write a bunch of words that described how good they are, but I couldn’t find any. Pictures are MUCH better. Drool away, because they’re AWESOME. How do you make your pecan meal? Do you make these with almond meal too? I think pecan meal is sold as is, but I just buy whole pecans and use a food processor to chop them up into the meal. I’ve never tried almond meal but I bet it would be really good! I’ll have to try that in my next cookie experiment. Thanks so much for stopping by! !